We’re on track to win back net neutrality protections — but it’s going to take work. Call your representative TODAY and urge them to support the petition to force a vote to restore net neutrality? Let them know that a new poll found that voters overwhelmingly support net neutrality and want lawmakers to use the CRA to trigger immediate action to restore it, but even more significantly in this critical election year, it shows that a majority of voters in battleground districts will consider net neutrality when deciding who to vote for, and that number is even more significant for undecided and independent voters. Billboard mockup by Fight For The Future. 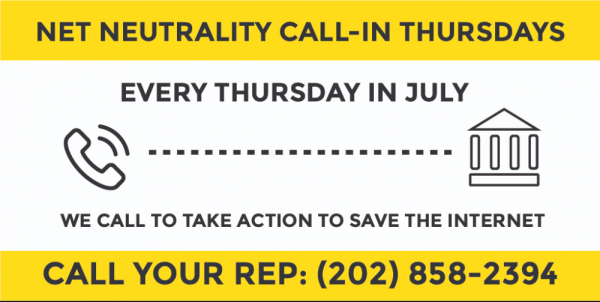 In addition to mass call-in days, the net neutrality coalition is taking other actions to get sponsors to the Congressional Review Act (CRA) reversal of the Federal Communications Commission (FCC) rule ending net neutrality. One group, Fight for the Future, has been very clear that it will not allow lawmakers to attempt to fool their constituents by supporting symbolic net neutrality legislation while refusing to sign on to the CRA resolution, which has already passed the Senate and the only viable method of restoring net neutrality protections this year. They will be putting up billboards in swing districts to highlight House members not supporting the CRA petition. Rep Jeff Fortenberry (R-NE) just made that list by cosponsoring Rep Mike Coffman’s 21st Century Internet Act without following Rep Coffman’s lead by also signing the discharge petition for the CRA. You can chip in and help crowdfund the billboard campaign here. The Federal Communications Commission (FCC) has repealed net neutrality, kicking the door wide open for Big Cable companies to block and slow traffic online. But we’re doing what many thought impossible by getting closer and closer to convincing Congress to overturn the FCC. Use this call tool to reach your representative — just enter your information, and we’ll connect you and provide a script. Or you can call (202) 858-2394 to get connected. Thanks to a massive public outcry, the Senate passed a Congressional Review Act (CRA) resolution that would reverse the FCC and restore net neutrality. Now, we’re just a few dozens of votes away from being able to pass the same resolution to save net neutrality in the House — and just last week, the first Republican in the House joined the resolution. We have momentum, and if any movement can pull this off, it’s the movement for an open internet. We’re looking to secure as much support before representatives head home for the August recess. That’s why we’re organizing call-in Thursdays every week in July. Your member of Congress is key to restoring net neutrality — will you call them today and ask them sign the discharge petition to force a vote to restore net neutrality? Use this call tool to reach your representative. Just enter your information, and we’ll connect you and provide a script. Or you can call (202) 858-2394 to get connected. Months ago, pundits and experts across the country repeated their cynical prediction that we could never pass the CRA in the Senate, but we did. We can do the same in the House, but we need to make our voices heard.The fight for net neutrality has been raging for years, and this summer is absolutely crucial. We need to keep consistent pressure on. Join us by calling your member of Congress today!